As the angry sun casts it’s rays perpendicularly over Tamilnadu, there won’t be any respite from the ubiquitous heat in all parts of the state. As usual sea breeze may offer a solace by early or late afternoon to coastal areas. Rest of Tamilnadu will continue to sweat and suffer from the unrelenting heat. Convective rains in the form of Thunderstorms might continue in the North interior, Central and western districts of Tamilnadu, South Interior Karnataka and Southern Andhra Pradesh also. Meanwhile Thunderstorms accompanied by hails are possible in J&K, Himachal Pradesh due to a Western disturbance. Heavy rains are forecast for a few places in Northeastern states too. 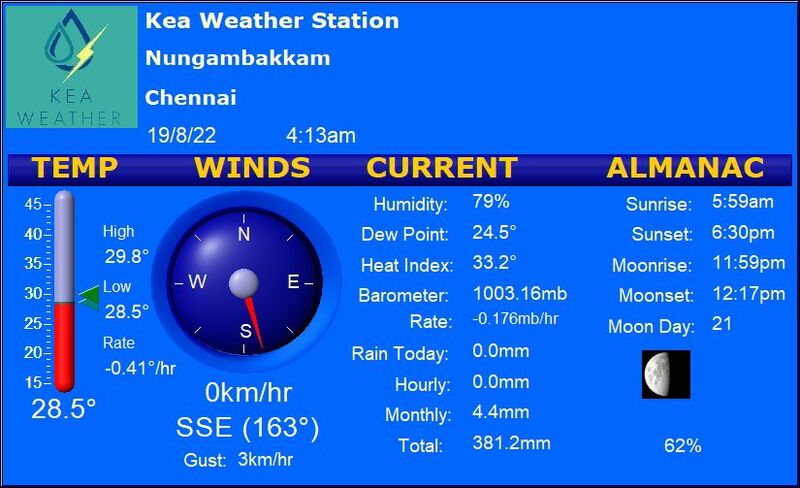 Chennai – Hot conditions to continue with a maximum of around 37 degrees and a minimum of 29 degrees. Coimbatore – Partly cloudy sky with a high of 37 degrees and a low of 25 degrees. District might see Thunderstorms later in the evening. Madurai – Unrelenting heat to continue with a Maximum around 41 degrees and a minimum of 28 degrees. Thunderstorms are expected over the region. Tiruchi – Hot day is expected with probable Thunderstorms in the evening . High of 41 degrees and a low of 29 degrees. Vellore – A scorching hot day with few clouds around. Maximum of 43.5 degrees and a minimum of 27 degrees.